Aotearoa must make a commitement to more than a 40% reduction of emissions, the time to act is now, and the government must STOP subsidising the fossil fuel industry! 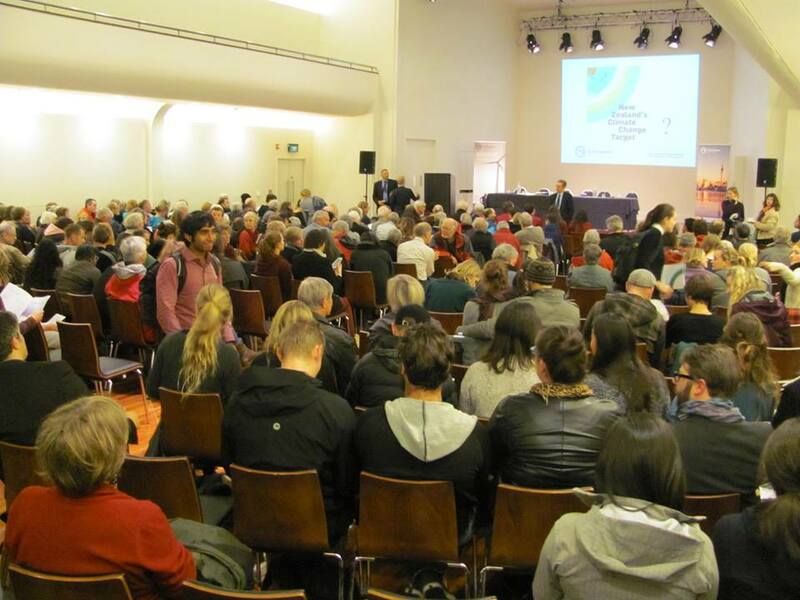 Hundreds attend NZ Ministry for the Environment consultation on Climate Change in Dunedin 21 May at Town Hall. When asked about the government organisation New Zealand Petroleum and Minerals’ existence undermining the mission of the MFE, the official representative reported no comment. When asked if by bilateral cooperation the MFE would be interested in seeing an end to government subsidies to the petroleum industry, the government official again had no comment. Click the image to make a submission to the MFE before 3 June 2015. Aotearoa has the responsibility to be a world leader. Make a submission to the MFE before 3 June 2015. The most important thing is to protect New Zealand from dangerous temperature and sea level rises. At the very minimum, a 40% emissions reduction by 2030 is necessary to prevent serious effects to our way of life, our economy and our environment. While this target is to start in 2020, the time to act is now. – As a parent, I’m concerned about how climate change will shape my children’s future. – I’m concerned about climate change because it affects our native wildlife. According to Forest and Bird, tuatara and albatross are already suffering the effects. – As a Christian, I believe we must stand in solidarity with the people who are on the frontlines of climate change, like our neighbours in the Pacific. – As a doctor, I’m concerned about the increasing health risks to New Zealanders. 1.The Government’s consultation document treats action on climate change as a cost. Actually, it is failure to take action that will cost us. Climate change is a threat to our economy and the things it most depends on, like tourism and farming. Our agricultural nation depends on a stable climate. 2. Responding to climate change is worth our while. A cleaner greener future offers huge opportunities for our country, including better transport choices, safer streets for cycling and walking, good jobs in the rail and renewables industries and export opportunities for green technology. 3. The Government consultation materials suggest that New Zealand’s unique circumstances make reducing carbon pollution challenging. This ignores the enormous gains we can make by investing in better transport choices, including rail freight, cycling and public transport. 4. I request that you stop downplaying our responsibility for climate change saying New Zealand is too small to make a difference. It’s not in our national character to sit on the fence and watch others get the job done. 5. Some public meetings were announced with less than a week’s notice and very little publicity. I’m concerned that you’re not taking the views of New Zealanders seriously. 6. The government must cease subsidising the fossil fuel industry. -Why is the government funding, recruiting and subsidising the fossil fuel industry when we know climate change is an issue facing us now? -Can other countries take our commitments seriously if meanwhile our government organisation, NZ Petroleum and Minerals is recruit fossil fuel companies to drill up our EEZ? -Why has the Government provided so little notice for this consultation? – How will submissions to the consultation be used to inform the Government’s target? – Will the results of the consultation be made public? – When will the Government announce the results of the consultation and New Zealand’s target? – Has the Government done any analysis to assess the cost of not acting on climate change? Such as the impact of drought and floods on our farming sector? – Has the Government done any analysis to assess the benefits of acting on climate change? Such as more jobs in the green tech sector or health benefits through reduced air pollution? – According to Ministry for the Environment projections, current policies are putting New Zealand on course for a 50% increase in greenhouse gas emissions. This is happening at a time when all the technology exists for us to reduce our pollution. – According to the New Zealand Climate Change Centre, time in drought could triple in NZ by 2040, extreme rainfall and flooding could increase by 32%. – According to the journal, Science, one in six species is at risk of extinction due to climate change. Risks are highest in New Zealand, Australia and South America. Check out this blog FossilFools for student and supporter, Siana’s take on the meeting.